I was just wondering if it was possible to directly store words in a table row with the correct hyphenation (to be used at the end of a line of text). I do not mean any integrated Microsoft option to hyphenate words automatically as I need to use an own hyphenation for some words in some languages, depending on their context. In the table view the word would still show up normally but if needed soft breaks would be enabled in a text. e.g. into = in-to. Dear ASP.NET, stop setting my threads to answered only cos I had no time to check em. I'm not fulltime programmer n only get to programming every 2-3 weeks but I ALWAYS answer n close solved threads, but u DON'T know if a problem is solved for TS or not! That's what I'm doing right now, but I saw that MS SQL Server supports the hyphenation described above and wanted to know if there is a way to tell MS SQL Server how to hyphenate words. Can you explain the statement above or link to the documentation? The hyphen character has special meaning in SQL so you'll need to delimit the value otherwise you can cause unexpected errors when inserting or querying data. I saw it in my db directly, after adding some words extracted from a website. As the website did not use soft breaks or anything alike within these words, I thought it must be MS SQL server doing that. So I wanted to know how it could be done. Searching the internet did not lead to any results that far. Maybe I used the wrong queries on search sites. Can you explain plainly what you are trying to accomplish? So I would like to know how to tell MS SQL Server where to put soft breaks for hyphenation of words at line end of a text. e.g. In html you can use shy or similar tags. The words you extracted from the website most likely had a soft hyphen already in them since SQL is not adding them for you. If you just look at the html source for the site you extracted the words from, you wont necessarily see that a soft hyphen had been used (unless they used the html entity &shy). You can enter a soft hyphen directly by holding the alt key and typing 0173 on your number pad. Nope, that's what I already stated before. They had not, I had source checked with Firebug. 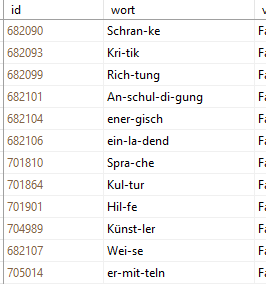 There were other words with soft breaks but definitely not the words that were extracted to enter them into my database (except of course Firebug would not show all of the soft breaks). But still your post answers my question. ;) So in fact I can simply add them with alt shortcut or if I add &shy to a html source to be imported. Firebug follows the soft-hyphen rules and does not display the soft-hyphen character at all unless it is at the end of a line and used for a linebreak/reflow. You can use firebug on the wikipedia page I'd linked to to see the behavior as that wiki page contains example text littered with soft-hyphens. If you want to see all of the soft-hyphens in that sample, copy the sample and paste it into notepad.